Imagine having the ability to leave your bulky light stands at home; instead of mounting your speedlights discreetly to nearly any surface or object available at a venue without being intrusive to guests, avoiding dangerous trip hazards that can occur with light stands. The RapidMount SLX does just that! The SLX is a multi-surface speedlight holder that mounts off-camera flashes to a wall and other surfaces using the included specially-formulated, pressure-activated RapidMount adhesive strips. The SLX stays securely attached to the wall while the arms cradle your speedlight and drawstring keeps it in place. The RapidMount SLX adheres to and removes from walls quickly and leaves no residue upon removal with the help of the RapidMount adhesive strips. 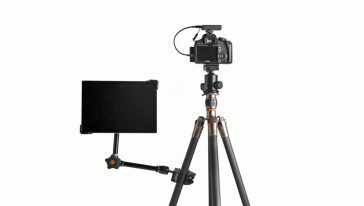 Mike Hagen of Visual Adventures recently published a video showing the RapidMount SLX in-use, mounting a flash behind the model as a backlight. Check it out below!